In Jane Austen’s Sense and Sensibility, we follow the life and loves of two of Austen’s most memorable heroines, Elinor and Marianne Dashwood. Despite the close bond between the two sisters, it immediately becomes apparent how vastly different they are from one another. Elinor is sensible, too sensible for her own good. She is polite to a fault, and somewhat reserved. Marianne, on the other hand, takes after her mother, in the sense that she’s much too romantic, too emotional, and too expressive. When the novel begins, the sisters live in Norland Park with their mother and younger sister, Margaret. Their father had passed on, and had left them with a small income—a pittance compared to what their half-brother (a product of a previous marriage for Mr. Dashwood), John, received. The entire Norland Park was handed to him. And although he had promised his father that he would take care of his sisters, his selfish wife, Fanny, convinces him that to offer to help his sisters move to a different home is help enough for them. Meanwhile, we learn of a growing attachment between the ever-sensible Elinor, and Fanny’s brother, Edward Ferrars. Before any formal agreements can be made, however, Fanny learns of their growing closeness and insinuates herself into the thick of things by taking over Norland Park as its new mistress. Miffed by the sudden intrusion of John’s domineering and snobbish wife, Mrs. Dashwood accepts the offer of lodging from a distant relation—a certain Sir John Middleton from Devonshire. She moves her entire family to Barton Cottage, where the group is warmly received by Sir John and his family. There, the Dashwoods meet the local society. Despite their initial determination to keep to themselves, the family grows close to the affable Sir John, his reserved and elegant wife, Lady Middleton; her gossipy, matchmaking mother, Mrs. Jenkins; and Sir John’s good friend, the honorable Colonel Christopher Brandon. Colonel Brandon immediately falls for the beautiful and romantic, Marianne. But she remains uninterested and ignores the colonel in favor of the dashing and debonair, John Willoughby. By all appearances, the two appear in love and ready to wed. That is, until Willoughby abruptly leaves Barton Park for London. We later learn that Willoughby has traded Marianne in for a wealthier wife. Although he later attempts to justify his behavior, understanding the root of his greed only humanizes him—it does not redeem him. As for Elinor, she’s met with an even worse fate. Although Edward does make a brief appearance in Barton Park, we learn that he is engaged to another—the uneducated and cunning cousin of Lady Middleton, Lucy Steele. Though Lucy appears saccharine sweet, she doesn’t fool Elinor (and the reader) for a minute. Lucy is a master of passive-aggressive retaliation. Upon hearing of Elinor’s attachment to Edward, she immediately makes Elinor familiar with her ‘secret’ engagement. Elinor is sworn to secrecy. So while Marianne openly weeps for a lost love, Elinor suffers in secret. The good news is that both sisters do find their ‘happy ending’. Having proven his enduring love for her, Colonel Brandon eventually wins Marianne over. As for Elinor and Edward, their happy ending comes at a hefty price. Upon learning of Edward’s engagement to Lucy, his mother cuts him off financially. The wealth he stood to earn as the firstborn son was passed on to his vain and selfish brother, Robert—who incidentally, ends up under the claws of the ultra-clever, Lucy. 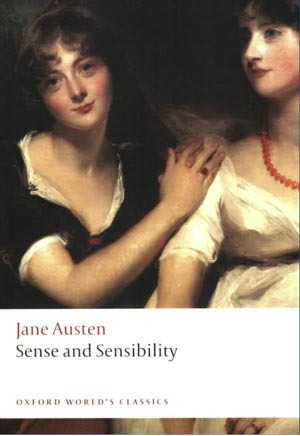 There’s a lot that goes on in Sense and Sensibility—but that’s the beauty of this novel. All these twists are integrated perfectly, seamlessly, so to speak. I didn’t feel like anything was ‘forced’ in the novel. When Willoughby and Marianne fell in love in the span of a week, it was relatable. Considering Marianne’s age, (not even 17 at the start of the novel! ), it’s easy to see how her world could revolve around the handsome and rugged, Mr. Willoughby. And though, these days, it may be difficult to find a woman possessing Elinor’s reserve, fortitude, and forbearance, considering the setting of this novel, her behavior makes perfect sense. The novel was set in the years between 1792 and 1797—a time when decorum took centerstage. Now, I know that some people don’t like the ending—with many wishing Marianne ended up with Willoughby, but I think the ending was apt. The greatest of passions often burn quick and extinguish in the night. The great loves are those that endure, like a slow, steady flame. At least, that’s what I believe—that’s why this book makes sense to me. One of Austen’s greatest strengths as a writer is her ability to create a myriad of ‘real’ characters—and it really is a joy reading about their interactions. From the passive aggressive arguments between Elinor and Lucy to the impassioned speeches of Marianne and Willoughby, Austen creates a dynamic world filled with dynamic characters. Now, if I were to be nitpicky and pick out the least fleshed-out character, then I’d have to say, Margaret. She’s not poorly-written, not at all. She simply falls into the background and is forgotten for a long time. But all good stories have their wallflowers, so this is hardly a point against Austen or Sense and Sensibility. Elinor Dashwood. Some would call Elinor reserved, or even cold. But to me, she’s a lovely example of inner poise and graciousness. The way she handled Lucy’s constant barbs had me cheering her on, and secretly wishing she’d b*tch-slap the two-faced B.
Charlotte and Mr. Palmer. They just might be my favorite couple in the novel. Charlotte and her dear Mr. Palmer were an extremely clever addition to the group. They provided comedic relief when needed, and they also showcased Austen’s versatility as a writer. Lucy Steele. Oh dear. Lucy is the perfect villain in this piece. She’s extremely cunning and extremely fake—how could one not hate her (or love her)? Marianne Dashwood. Marianne may have acted like a brat 60 percent of the time, but she did learn her lesson, and at least, she was true to herself. John Willoughby. Everybody loves a bad boy—and I can definitely see Willoughby’s charm. He’s the epitome of a man’s man. The fact that he’s a bit of a libertine just adds to the whole appeal. And that’s why he beat out Edward in this list. OVERALL: Definitely worth an annual reread! Sense and Sensibility never fails to lift my spirits. I try to reread it at least once every few years. If/When I get married, I’d love to hand out this book to my female guests. Maybe fancy pens for male guests. Hmmm. Elinor: I do not attempt to deny that I think very highly of him–that I esteem him. Marianne: Esteem him! Like him! Cold-hearted Elinor! Oh! Worse than cold-hearted! Ashamed of being otherwise. Use those words again and I will leave the room this moment. I DEFINITELY will. It’s my second favorite book EVER.